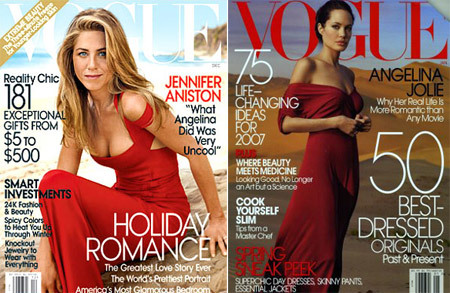 By now you should’ve been wondering who’ll get to cover the last Vogue US issue (for 2008!). Well, it’s Jennifer Aniston! I dug the cover and I was right. The red dress is scaring similar… I don’t know if it was intentional, but someone should’ve seen the obvious moral re-edit. Jennifer has nothing to do with Angelina. Not in professional status, not in physical appearance, not in media impact. Maybe she wanted to prove herself independent and healed, instead, all she did was getting drawn into a media trap, easy money for Vogue. Anna Wintour’s US Vogue, going slowly but surely into gossip and celeb press. Someone should handle her a glossy gossip magazine, spear us the suffering! And I imagine, since it’s a Holidays issue, the red dress goes for Christmas, right? Or the sandy sunny beach goes for Holiday, right? And that pose with the dog? We know she’s lonely and alone, but did they have to drag the dog in the story, already at its worse? I think that Vogue did this on purpose. I hope this Angelina/Brad/Jennifer thing stops here with this magazine but I doubt it. I would like to hear what Brad thinks and says of his marriage ending though. That’s an angle that has not been really broached. I get the impression its always up to the women in stories like this to deal with the mess or pick up the pieces. Won’t Brad stand up and defend his wife and family? And I do believe Jennifer probably needs more therapy as she’s allowing her Brad episode to continually hover over her head. Its strange how she emphasizes her hurt with Angelina and not Brad. Afterall he was equally involved. lil cutie that Angelina comment was way HARSH! you obviously prefer Ms Aniston to Ms Jolie but call some one that name is an insult to ALL women. I think Jennifer can talk now openly and free about this because she’s over it. Give her a break, this must have been very painful for her. And there’s another thing that always made me wondering: there’s a married man and a woman who always claimed never wanted to give birth but adopt. So, I wonder how it comes that this adult, intelligent and educated people never had heard about birth control. Excuse me, but Angelina was pregnant before Brad and Jennifer were divorced! A bit fast ain’t it? Also known as one of the oldest trics in the world…that happens…alas…. I think you’re absurd! How can you say “If Brad wasn’t available, Angelina wouldn’t have had him. End of story.” HE WAS MARRIED TO JENNIFER ANISTON! That’s how he wasn’t available! If you to condone infadelity then I feel sorry for you when you’re married because that will be one tragic marriage. Jaclyn, I obviously wasn’t clear enough, let me explain what I meant – (unhappy) married people end up in a miserable marriage with time going by because their tolerance levels for one another reach the bottom. In fact, (unhappy) married people end up married because of circumstances and various life principles. Those who are fortunate enough to be happily married aren’t available for nobody under no circumstance. And even if someone could be interested in one of them, he/she’s made clear that nothing is possible because there’s no room in that person’s heart/life for someone else than his/her wife/husband. That’s how I see things happening in a marriage. That’s how mine is and I wish more people could be that lucky! If you’re married, you’re married with your half, forever. There’s no space left to fill with someone else. If there’s a gap, no matter how unimportant, it’ll end up filled by someone else. OUTSIDE the original marriage. So, where’s the marriage then? What’s it for? Just for social purposes? Dolly Bird, Ellington, you’re right, it would be rather interesting to hear his side of the story. But it seems he’s a bit shy… he lets the women fight his fight. Truly a man’s ways, very “brave” and “just” of him! The very sudden pregnancy is still questionable though. And no, it didn’t happen to me so I don’t write this because “it makes me feel better”. Just for the record. I’ve seen it happen how some women got their man……one couple is still together until now…. Adriana,I did not find Angelina’s pregnancy sudden. She and Brad had adopted Zahara together, and he had became legally Maddox’s father way before she was pregnant. Shiloh did not appear suddenly. Also by then the pair Jen and Brad were legally separated. She was pregnant with Shiloh around the time they were filming “A Mighty Heart”. People only cheat and leave their partner or spouse if they have the room to and have already left the relationship or if they have no vested interest in the relationship anymore. Its a sad thing but it happens. Ellington in my memory it was like that. I can be mistaken tho. It was my job to find the info. Yes, getting paid for ‘digging up dirt’ as I called it at the time tho it was only a part of the job….but still I think that pregnancy was very fast. In the end she and Brad adopted Zahara together. But Angelina started the procedure before Brad became her partner. Kpriss, from a very reliable source who interviewed Brad twice I’ve heard he’s a bit shy and even a bit uncomfortable with the press. But start about architecture and the man change! Anyway, in general, I don’t think that its always the case that people do miss something in their relationship. Some people like to add something to it. Its still questionable if people are made to be monogamous. Many people have or consider more than one person a precious love in their lifes. Well, I guess in the end we all hope to live happily ever after and getting old with someone. So lets end this and I wish the ‘subjects’ and we all will live that happily ever after life……..
You should all read the article before you judge her. She conducted herself quite well and her comment about Angelina was not due to unresolved issues about the situation but how she felt it was inappropriate for Jolie to discuss how Pitt and herself developed feelings for one another while Pitt and Aniston were still married and Aniston was unaware there was anything going on. She said that stuff should be kept private. It’s a good interview – read before you judge. Thank You Jess… Finally someone said the right thing. I read the article and saw the interview with Opera and in No Way did she look like she was unhappy. She HAS moved on and just answered a question that was asked. Anistion her self says this is old. Read before you judge….Good advice Jess. I don’t think anyone’s violently judging Jen.Personally I’m a fan since Friends but the 2 posters above are right.If we can we should read the article in question before throwing a stone or sponge. I agree with Dolly Bird. “Rachel” was my fave “friend”. She has made me laugh so often…..
And there’s another thing, even IF Jennifer shouldn’t have been over it, we can not judge that either. We have no right to judge someone’s elses emotions and feelings. Jennifer has always showed dignity about this. She has never opened her mouth about this unfortunate period in her life until now…..tho not Angelina….. Enough with the taking of sides! Angie the home wrecker, Jen the woman scorned. I like them both although I must admit to detesting the show “Friends” not because of Aniston, just the whole show. I found the show and the situation insipid, but that’s just me and my taste. They are both talented actresses Jennifer was great in “Friends with Money” and Angelina was great in “A Mighty Heart”. Yes it hurts to lose someone and yes it feels wonderful to fall in love with someone. They are both women and both human. I don’t think anything was said in either article to spite the other they were simply expressing their feelings at the time and answering the questions posed. So please stop being harsh to Jennifer and to Angelina. Neither is better or worse than the other. And in all of this I ask yet again how come NO ONE says anything about Brad in all of this? He is the catalyst. And Brad has a kind off habit to morph into the woman he’s with……ever noticed? I am just tired of people demonizing one or the other. This argument is getting tired and hackneyed. Its just annoying that women always seem to revert to hating one woman or the other and not taking note of the man as he is the catalyst for all of this angst. Not many, save you and me and Dolly Bird have asked about Brad’s responsibility in all this. In an other vein,Brad does blend in with his partner that appears to be how he likes to live his life and his love but that’s his choice. It also appears to be the way of most couples, one seems to dominate the other, or the one acquiesces because that is their want. just to throw in my two cents, Brad was a married man. Jolie should’ve kept her mouth shut. as i see it, it was “uncool” of her to make it clear to to the world that she and Brad were cheating, becoming involved with one another while he was still married. why be proud of that behavior, and announce those actions? has she no sense of (healthy) shame or discretion? Anniston has presented a ladylike fairly exterior to the world, and Jolie has once again shown her level of interpersonal and personal evolution. As for Pitt, … trashy. just a trashy weak guy. In response to your post. 1.) “If Brad wasn’t available, Angelina wouldn’t have had him.” So being married doesn’t mean you are unavailable anymore? I kind of thought that marriage put someone off limits? No? 2.) “No reason whatsoever (besides getting publicity)” Jeenifer is actually promoting her movie Marley & Me. You probably didn’t realize that. 3.) ” We know she’s lonely and alone”. Really you would know that from who? Jennifer has many friends, family and men in her life. So I guess the only people who are not alone are those who are married and have children? Single women are alone and lonely? 4.) “but did they have to drag the dog in the story” She is promoting a dog movie – a dog in her pictures is a brilliant move. Obviously the publive has not grown tired of this triangle. I think that Jen interview is wonderful. Jen is not lonely, not alone and living a good life. It is really about time that she stated what she thought about what happened. Until she did no one would let it rest. Jen is a class act. Jennifer Aniston obviously can’t get over herself. Yeah, he left you but Angelina is just the one to blame. And plus, Jen, get over Brad, because he DID. haha, you make so much statements to where you balance your shame-fame to the top headlines. Gosh, angelina is now happy and to think that you’ll get brad back, you ain’t cool, or UNCOOL. He was probably not happy in your arms, and got tired of your thin lips, so he got caught up with the fuller lucious lips of ANGIE. And how old are you? 39? wow, grow up. And anyways, you can never top angie’s movies or what not. Anyways, just my thoughts, keep it cool. To correct myself for the second sentence. I meant to say, BUT ANGELINA IS JUST NOT THE ONLY ONE TO BLAME. I am so sick and tired of people talking crap about Jen because she made ONE comment that the media spun out of control. She has been silent about this subject for 4 yrs. We all know for a fact Angie hasn’t. So What, if she said Angie wasn’t cool for putting a timeline in the media no less of them falling inlove. If that happened to anyone with a heart that would be uncool. She has made it clear that she is happy for Brad and has moved on. I think the media and people who just want to talk crap doesn’t want her to move on. They are two different types of people, but that doesn’t mean we should hate them for it. Either way they are doing better then most right about now. Also, we DON’T REALLY KNOW WHAT HAPPENED THEN AND NOW. The media may act like they do, but come on, if you really believe everything that is said, you are believing a whole crap of lies. This whole situation is bad!!! I wish they would just leave them all out of the news…it sickens me. Brad and Angelina should both be ashamed of themselves…you need to be completely out of a relationship before you get into another one. I think if they had given it sometime in-between the relationships, there wouldn’t be so much criticism. You may like the new couple, but I will never, to me they lack morals. Too bad for the kids…for once they are older they will look at the movie as not when their parents fell in love, but home wreckers. Thats how I feel about it…but then again there is very little morals in Hollywood any longer…its a dying breed of actors that prefer their private lifes stay private!!! Good Heavens is this clan war still going on? LOL! Hey I’ll take this oppurtunity and throw some mousse au chocolate in the fan and divulge that Jennifer Aniston admitted to being photoshopped for her cover and layout of the recent GQ edition.Where she was Still talking about Brad and Angie..
Don’t tease me with mousse au chocolate Dolly Bird that’s almost provocative! Yummy! But have you read the article in GQ? Before we get messed up in more clan wars? Anyway Jennifer’s new movie was box-office nr.1 in the US last weekend while Brad’s was 2. So maybe this is a bit of a triumph for Jennifer? Pffff…. Yay Jen has a hit movie! Alrighty then! I am beyond sick up and fed with the Angie bad Jen good stuff and vice versa and they all make comments about everything but hardly a peep from Brad. What’s done is done… lets get over it shall we? We were not in their any of the relationships and no one knows what really happened except them. Also in regards to Jenn’s film and Brad’s film. Dog films appeal to the lowest common denominator, not saying that they are bad or wrong but that is a fact (‘Beverly Hills Chihuahua’ anyone?). Brad’s film is an adaption of a lovely short story written by F. Scott Fitzgerald. (I wonder how many of the dog film loving audience knows who F.Scott Fitzgerald is?) They are two different genres that appeal to different markets.The final test will be of course the awards season. I don’t see Jennifer or her film being nominated but Brad and Cate Blanchette are receiving stellar reviews and accolades. LOL!!! Don’t anyone reckon with Ellington when chocolate mousse is manhandled! Ellington, you’re as clear as mountain spring water, as usual! Of course dog movies have that special something! Especially when Holidays season around! As for Brad, I have been thinking (while reading your messages and the pro-cons of previous commentators) – I think he fancies himself as an elite kind of guy. Someone who made Fight Club could never get into a man-eaters-war, right? Because he’s so much better than this! He’s just.. beyond! If he couldn’t reach bourgeois-stardom-ness with Gwyneth, he took a little time off and play it smooth with girl-next-door Jennifer Aniston and then he got his shot to weird-and-beyond-stardom-ness with Angie! How could he say no? Because now, besides having done that brilliant movie Fight Club, he also is the father of Angelina Jolie’s (natural) children! Top that! i was just kidding Ellington. I don’t care for box-office numbers really. I love dogs though AND Scott F. Fitzgerald! maybe stylefrizz or whatever should get columnists who are literate. just a thought. Please be aware that Stylefrizz has fans from all over the world and not just from English speaking countries.Do spare a thought for the participants here who make the effort to write English as best they can.I’m sure they do not mean to offend anyone if they make grammatical or spelling mistakes.I plead guilty sometimes. I think we’re all here to have some fun and like to be informed at the same time. Come on d try to be a bit more tolerant.I’m sure you didn’t mean to be nasty and are just concerned at the state of the English language today. Have a nice day d! I’m sorry for my grammar and other linguistic mistakes. Its not my mothers tongue and I’ve had never any lesson. So I’m not really illiterate! Criticism though can be a very good thing when it add something to a subject don’t you think? We love this blog but are not columnists just people that like to reply to the topics and participate. Shut up shut up shut up shut up. End of discussion ladies!!!! Huh? Shut up? We did shut up….six months ago! LOL! I think Jennifer Aniston is one of the hottest women on the planet…my opinion If she was a cake, I’d eat her up! This is an old article but this baiting by Aniston was blatantly clear. Jennifer was classless to mock Angelina’s cover and then make a snide remark reacting to a misquote from Angelina’s interview. Angelina DENIED having an affair with Brad Pitt in her Vogue interview. She didn’t say she and Brad developed feelings for each other, she described their friendship on Mr. and Mrs. Smith and later on vaguely described that they got together after his separation. Brad also clarified another infamous misquote where the media misportrayed something Angelina said. The original quote was referring to their characters but part of that got omitted. – the entire ‘triangle’ was ridiculous, I think it was just born in people’s imagination. There’s hardly any way to ‘steal’ someone’s man if his heart isn’t free – maybe it was for the best? who can say that Jen and Justin weren’t meant to end up together?